WINNER OF THE 2014 NATIONAL INDIE EXCELLENCE CHILDREN'S PICTUREBOOK COVER DESIGN AWARD! 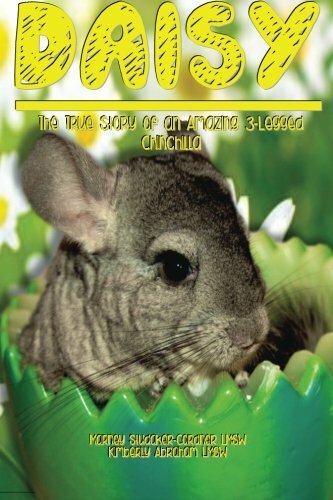 Ages 4 and up Daisy: The True Story of the World&#x2019;s Most Interesting 3-Legged Chinchilla is a book that shows children the value of not only understanding and accepting differences, but celebrating and embracing the characteristics that make each of us unique. Daisy&#x2019;s story is a heartwarming tale of love, friendship and survival. After a tragic accident, Rosie the Chinchilla learns that even though her best friend Daisy looks different on the outside, she&#x2019;s still spunky, loving and fun. Rosie learns to appreciate and admire her friend&#x2019;s strength and determination as she not only survives losing a leg but learns how to run, play and do everything she always loved. With her strength and spirit, Daisy is a true hero! &quot;I love Daisy's story! Marney and Kim have done a wonderful job of helping children see that our differences are what make us awesome! We are all different in some way or another and Daisy is a fantastic example of how great that can be.&quot; &#x2013; Ryan Haack, www.livingonehanded.com Learn more about Daisy and her life, including additional pictures, on her blog at www.therapiesinapod.com. Parents, educators, counselors and mental health professionals will also find a free companion Guide for Activities and Discussion to facilitate and support children in learning about differences. Marney Studaker-Cordner and Kim Abraham are licensed Child and Family therapists in the Flint, Michigan area. They have provided therapeutic services and support to families dealing with concerns such as trauma, bullying, addiction, anxiety, depression, blended family and behavioral issues for over twenty five years. With backgrounds in child welfare, community mental health and early education, Marney and Kim have partnered to empower families, parents and children as they deal with the difficult issues facing society today. Marney and Kim have been contributing authors to the online parenting website Empoweringparents.com since 2011. Their publications include the book, The Whipped Parent: Hope for Parents Raising an Out-of-Control Teen (Rainbow Books Inc, 2003) and the CD self-help programs Life Over the Influence: What to do When Someone You Love Uses Drugs or Alcohol and The Oppositional Defiant Disorder (O.D.D.) Lifeline (Legacy Publishing Company, 2012). Kim Abraham is a national speaker on the topics of Bullying, Childhood Behavior Disorders, Addiction and Parenting. She has been an expert guest on the HuffPost Live and NPR Morning Edition, as well as local radio and television news shows. She holds certifications in Childhood Trauma Intervention, Trauma Debriefing, Grief and Loss Counseling and is an on-call volunteer for the American Red Cross. Kim and Marney are available for one-on-one consultation, professional collaboration and speaking engagements. Please visit www.therapiesinapod.com for more information on our services and materials including parenting articles and resources. Parents, educators, counselors and mental health professionals will also find a free companion Guide for Activities and Discussion for Daisy&#x2019;s Story, to support children in learning about and embracing differences.